White Island is a small uninhabited island off the north west coast of St Martins. 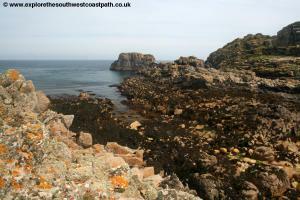 It is accessible at low tide by walking accross the exposed rocks. It is a real get away from it all destination with no buildings and despite it's small size has quite a variety of scenery including a sandy beach on the south coast and rocky areas on the north coast. 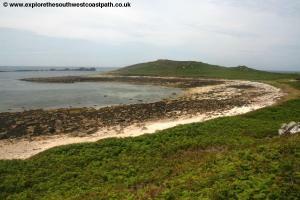 White Island can be access only at low tide and only by walking over from St Martin's. St Martin's normally has daily boat services from St Mary's and also has trips (albeit not normally daily) from the other inhabited islands. White Island is off the north west coast of St Martin's and so is most easily accessed when the boats from the other islands are using the Lower Town Quay which is then around a mile walk from the quay. The crossing is difficult, as you have to walk accross many rocks, covered with slippery sea weed and with sometimes fairly deep gaps between them. You must also check the tide before crossing, to avoid getting cut off. Due to the difficult terrain it can take longer to cross then you may think so ensure you have enough time to make the return trip before setting off. It is recommended to allow two hours from the access point on St Martin's to walk around the island and return to St Martin's. Also there is no path around all of White Island, so the walking on the island can be hard going. White Island is uninahbited and has no buildings, so there is no accommodation on the island. There is however accommodation on neighbouring St Martin's and it is recommended to check the walk around St Martins for details of the accommodation available on St Martin's. 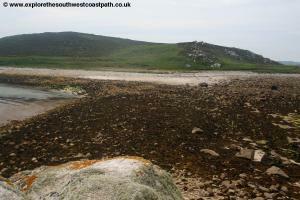 It is worth noting that there are no footpaths on White Island, so the going on this walk can be hard going in places. The first task is to cross from St Martin's. 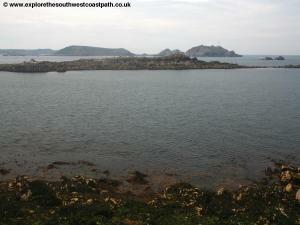 This is only possible at low tide, when there is an exposed rocky bar linking the two islands. Only cross if you are sure you have enough time to re-trace your steps, as although this rocky bar is short (around 150 metres) it is quite hard going due to the climbing over the rocks, which are often slippery and covered in sea weed. 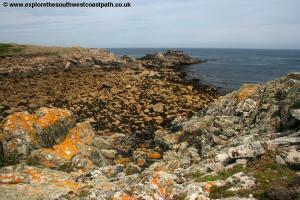 Once over onto the island, follow the sandy and rocky beach along the west coast, with the sea to your left. 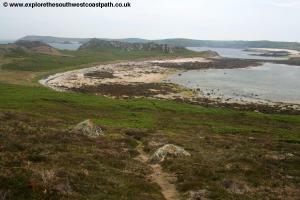 This is called Porth Morran and is a good beach although rocky in places. 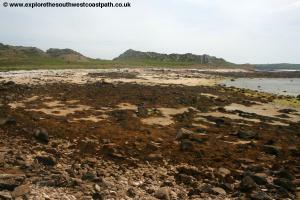 As you near the north end of the beach, it curves round to the left and you have an area of bracken ahead. Leave the beach here onto the grassy area behind and then take a feint path up through the bracken, initially with the bracken on both sides. This soon splits, with another path going off to the left, again feint. Take this path that soon comes out to an area of heather and follow it as it crosses diagonally over the heather (avoid trampling any new paths). Continue heading NW along the island until you reach the far NW corner of the island, at it's highest point on a rocky outcrop. You have lovely views from here over St Martins and also over to Pernagie Island and Round Island beyond, with it's light house. Re-trace your steps down from this rocky area but after only a few steps turn left on the grassy area and head down to the north coast of the island. 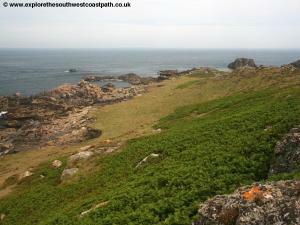 You can then take the path over grass to the very north east corner of the island. Follow the coast round, now heading south and as you reach bracken take the narrow path through it, right next to the coast, still on your left. This brings you round the back of a little rocky bay called Stony Porth. At the south end of the beach the terrain returns to grass and this narrow area of grass has only a few metres between the east and west coast of the island. 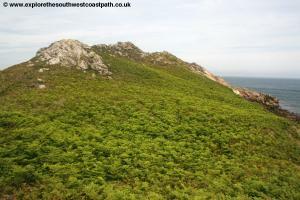 Keep on the east coast of the island as the path climbs and the terrain becomes more rocky. As you come to a narrow gully in the cliffs below turn around looking inland and take the path through the gorse and bracken area heading due south, passing the end of another gully. 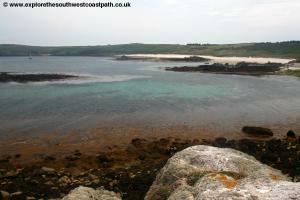 Here turn slightly to the right heading SSW to return to the beach on the west coast of the island. Follow this back to St Martins . The walk ends as you return to St Martin's. If you are not staying on the St Martin's, return from there to the ferry departure point, which is normally either the Lower Town Quay on the west of the island or the Higher Town Quay on the south coast of the island. The boatmen on the outward trip will advise you which quay to return to, depending on your desired return time. Ordnance Survey Landranger map 101 covers the Isles of Scilly and is available in the newsagents shop in Hugh Town on St Mary's or at bookshops nationwide as well as Amazon. 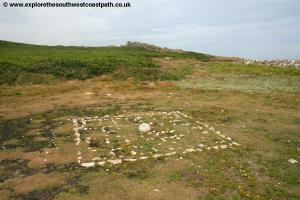 The link below shows a map of White Island and St Martin's.